Heat the oil in a medium size pot over medium heat. Add the pancetta or bacon and sauté, stirring often, until barely golden brown and some fat has been rendered. Bring the soup to a gentle simmer and cook, uncovered, for about 1 ½ hours for dried beans, or until tender, and about 30 minutes for canned. Make sure the liquid does not fall below the level of the beans during cooking. If so, add more water. When beans are tender, add the cooked meat and simmer for another 5-10 minutes to allow flavors to combine. Taste for salt and pepper and season if necessary. Fold in 4 cups dandelion greens just before serving. To cook the farro, combine the first 5 ingredients in a medium pot. Bring the grain to gentle simmer and cook, uncovered, until almost all the water has evaporated, about 25 minutes. The farro should be soft to the bite. To finish the soup, place a ladle of soup in each bowl. 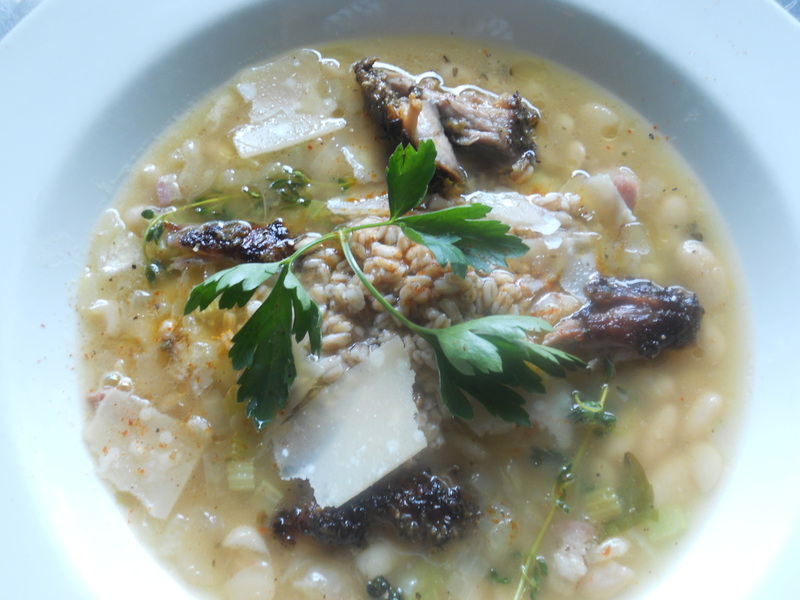 Place a large spoonful of farro in the middle of the soup. Drizzle with olive oil, sprinkle on 1 tablespoon cheese and a large pinch of the paprika per bowl. Finish with a leaf of parsley as garnish. Serve warm. 1. In a small bowl, combine together the kosher salt, sugar, juniper berries, coriander, black pepper, cinnamon, allspice berries, fennel seed, garlic cloves, thyme, orange zest and bay leaves. Pat the duck breast dry with a paper towel and lay them down on a paper towel, meat side down. Using a sharp knife, score the skin layer in a crosshatch pattern, about 1/8 inch through the skin but be careful not to cut into the meat below. Sprinkle both sides of duck evenly with spice mixture and let sit for 2 hours or overnight in the refrigerator. 2. Meanwhile, make the green olive butter. Combine the butter, a pinch of salt and pepper, the coarse olives, parsley leaves, capers and shallots until combined. Turn butter out onto a piece of parchment paper or plastic wrap and roll into a loose log. Store in refrigerator until needed. Brush away any large herbs or spices from the duck before proceeding. Place the duck breasts, skin side down, in a large (oven proof), cold heavy sauté pan. Put pan on the stove over medium to high heat and slowly allow the fat to render. After about 5 minutes, about 1/8 inch of fat will be rendered in pan. Drain off the fat from the pan into a bowl. You will need to remove the fat a couple times during cooking to ensure a crispy skin and crust. 4. To cook the duck, turn the heat to medium – low and continue cooking the duck until the skin is crispy and well browned, about 10 minutes time. Drain the fat off one more time and flip the duck breasts over and cook for about 1to 2 more minutes. Slice 1 slab of green olive butter onto each of the breasts and place the pan in the oven. Bake for about 10 minutes more, or until the duck is taut and springy to the touch. , about 8 minutes. Remove and let rest for 2 minutes. Finish duck with a sprinkle of Maldon salt on each breast. Slice each breast into ½ inch slices. Keep separate. 5. To make the vinaigrette for the salad, combine the first six ingredients in a bowl and mix to combine, tasting for seasoning and adjust if necessary. Toss the rocket (arugula) and frisee with about 2 tablespoons of the vinaigrette. Taste a piece with the vinaigrette and add salt and more vinaigrette if necessary. 6. To finish the dish, place about 1 cup of rocket and frisee on each large dinner plate, and place duck slices on top of greens. Add the braised lentils prebaked potatoes to the plate and serve.